I am trying find where a line (chosen by a user) intersects any of the multiple polygons within the shapefile. The shapefile is in EPSG:4326 and the coordinates are in (longitude, latitude). I have loaded a shapefile containing all the buildings (i.e. polygons) from the centre of Rome and have built a schema inside a database with a PostGIS extension (note, PostGIS version: 2.3). I realise I am most certainly at fault here, as I'm no PostGIS expert. 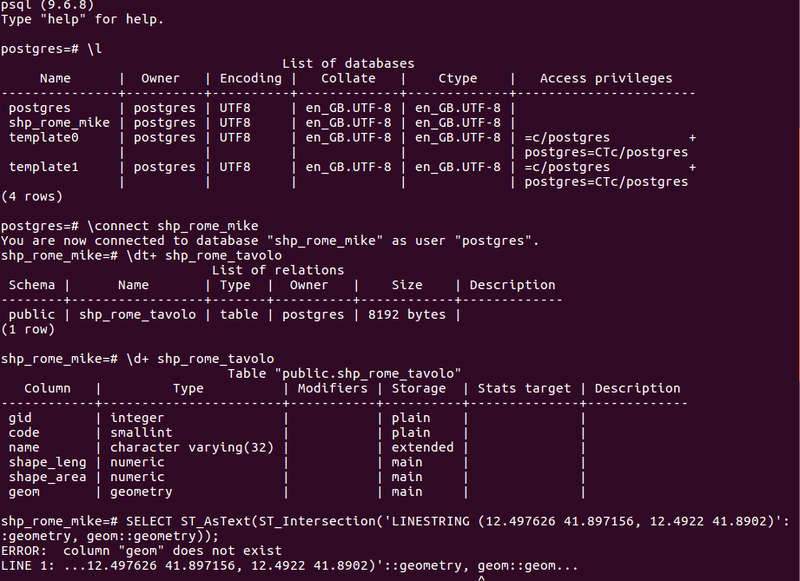 However, I'm stuck as 'geom' is a column in the schema, hence, I'm uncertain as to how to proceed. I have looked at the following similar-ish questions: Intersection of multi-polygons in PostGIS and Intersection between line & polygon in PostGIS? yet, I am still at loss on how to continue. You must specify the table name in a FROM clause. Also, you don't need to cast the geom column to geometry (it is already a geometry!) and you want to get a result only for intersecting geometries.